During my thrifty costume hunting for the Steampunk Wedding, I found myself surrounded by vintage birds. Wherever I went, there they were. Several followed me home. Three beautiful prints by Louis Agassiz Fuertes will be framed soon. An over-sized bird guide from the forties offers sumptuously thick pages filled with rich and detailed illustrations by Rex Brasher. 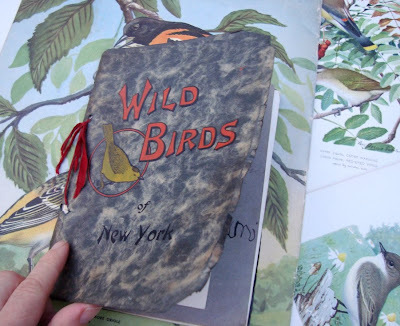 My favorite is a little hand-bound book entitled Wild Birds of New York. It's the sweetest little book ever and it was printed in 1912! At some point, I believe the cover must have fallen off. The original owner created a new one and bound it with a little strip of red ribbon. Holding it in my hands literally makes my heart ache. Did I need a little inspiration for more bird carving? No, but these images certainly motivated me to put everything aside and return to my flock. 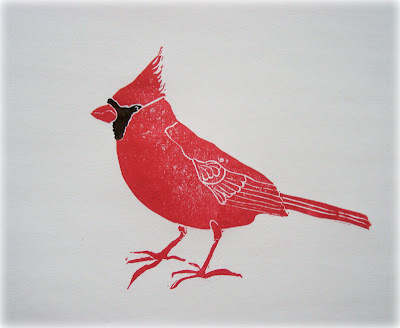 I had been wanting to carve a cardinal ever since I drew this silhouette last year. I loved the idea of my newest bird being incorported into my holiday creations... who better than our scarlet feathered friend. 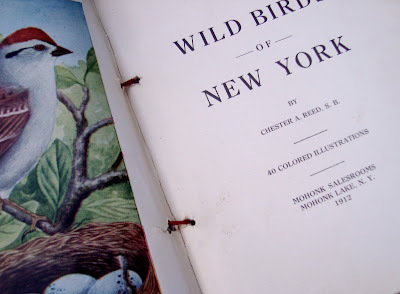 Not a single cardinal image in the Wild Bird book of New York! The one in the 40's guide looked a little sinister... or just starving. 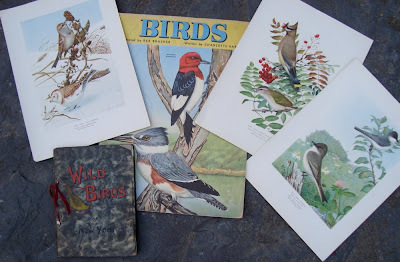 I searched through our own bird books, and then with enough inspiration began. I carved way into the night. After carving is completed, I always do several prints to clean up any rough spots. I'm loving him! He'll be adorning packages, journals, and so much more... just wait and see! Your cardinal is exquisite. Beautiful work! Oh my god, I love him!! Do you go in with a pen or something to do the black? He's very handsome. thanks you, two! Yes, Kate... I went over him with a black pen. It was kind of spontaneous. I don't usually add anything to a print, but I may with him more often, because it seems to enhance him quite a bit. Sweet fellow. He's beautiful and not sinister in the slightest. What beautiful work you do, it's gorgeous. This is my kind of post! I love it all. Your stamp is amazing! I love how thrifting can inspire crafting. Maya this is a fantastic post. 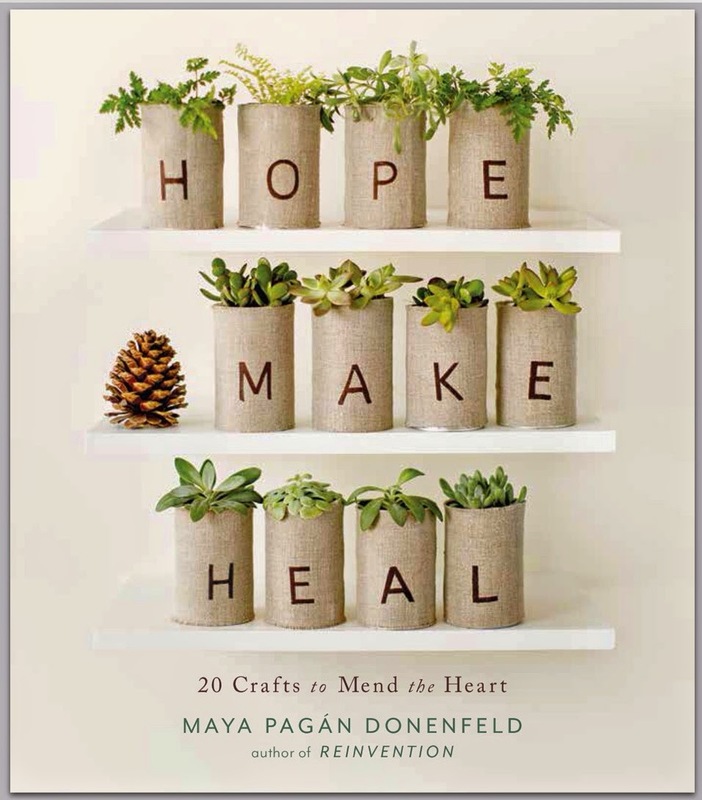 I love the book with the handmade cover and I believe having it in my hands would have evoked a very similar response. Your carving and stamps couldn't be more perfect. The perfect seasonal bird to make anything festive. Oh what a darling cardinal! Lovely work. Amazing stamp! Oh, how beautiful your cardinal is! 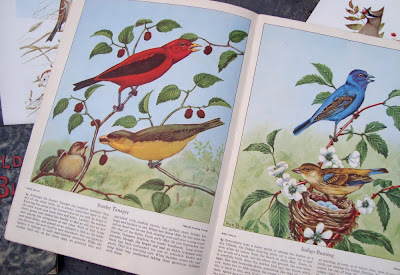 Your comments about the bird books reminded me of an old book I used to read as a child at my grandmother's farmhouse - it was called A Girl Of The Limberlost, published in 1909 and with the same well-loved cover and pages as your books. I think you would like it. Thanks for sharing with us! He is a super- beauty...hmm I better dig out that speedball kit I purchased months ago ..and never used..!! i have several vintage bird prints on my walls. vintage books are just incredible! Thank you for sharing this inspired beauty! inspiration everywhere! today i saw a huge crane landing on a small lake nearby; it was such a beautiful sight! your cardinal is so bright and cheerful! He's beautiful, cheerful, and perfect for the holidays! he is awesome! i love that bird. want him. WOW! Absolutely stunning - I love him! Oh he is spectacular! Lovely. You've captured his spirit. Great job! Oh my goodness! You have some serious skill. Love the bird! Oh, he is fabulous. Love the red. Seems so "right" for the season. Beautiful stamp making as always. That is amazing , I love your red cardinal ! Ooooo... so pretty! The black really does enhance him! Do you think you could do a tutorial on how to make stamps! I love your stamps and I'm dying to know how make my own! How gorgeous, your handstamping always seems to work out a treat! Oh, and i second Morgan's request, i'd love to see a stamp carving tutorial. He's gorgeous. Oh no, you may have inspired me to get out my carving blocks (I get so addicted to those things!) when I have so much else to do... A perfect little Christmas bird. Wow! There is no doubt...You..are..an ARTIST! Thanks so much for all of you enthusiasm! 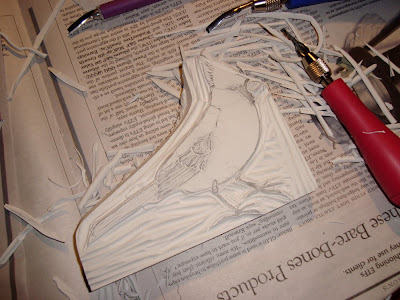 For a wonderful stamping tutorial, Geninne is the queen: http://blogdelanine.blogspot.com/2007/11/hand-carved-stamps-tutorial-part-1.html If you explore her site you'll also find wonderful carving videos and more. She has lists of tools,etc. Have fun! 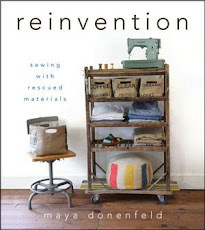 Even though it is such a busy time before the holidays, isn't it also the best time to be inspired and create new projects? Ahh!! I'm loving him! 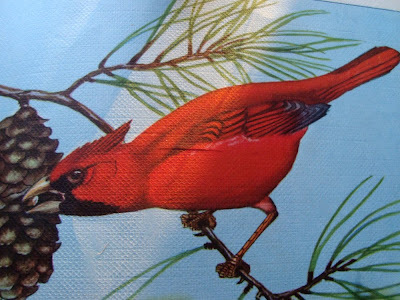 And being a Hoosier, the cardinal is my state bird (along with being the state bird of 6 other states...even better)! Just beautiful. I love this stamp! Living on the West Coast of Canada I have never seen a live one, only pictures, but it is on my list of things to do in my lifetime! I've always wanted to see the fiery colours of an East Coast Autumn as well! Thank you for sharing! Beautiful and so inspiring! I can't wait to see what you do with it. I just love the little cardinal! For being our state bird (Virginia) I don't see them nearly as often as I would like. I really appreciate you allowing us to view your stamp large to see the detail. I've been practicing my carving with white erasers..slowly but surely getting some skills. maya! that bird is gorgeous! absolutely stunning. and i love the black detail on his beak and eye. well done (as always). I love that handbound book. And your stamp is lovely. Your Cardinal stamp is beautiful. You're so talented and you make it look so easy. Beautiful work, Maya! I had a lovely few minutes between my walk and shopping, and what better way to spend it than catching up with your blog! Love your meditation on those rustic wrecks of cars. love it! 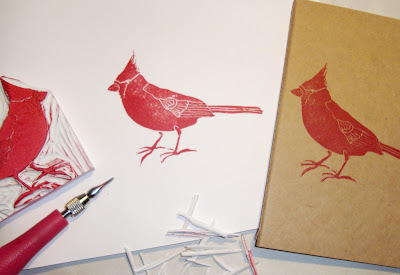 do you have a lino cutting/printing tutorial? I really like this cardinal. I'm always drawn to them, perhaps because we don't have them where I live.